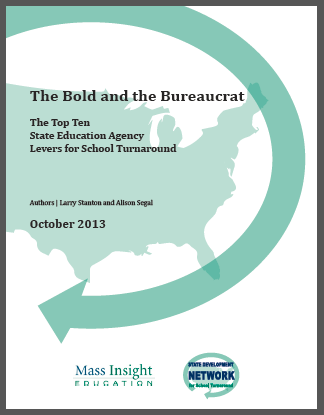 Our newest publication out of our State Development Network, The Bold and Bureaucrat: The Top Ten State Education Agency Levers for School Turnaround (Toolkit), provides the reader with what we have identified as the top ten “levers” for a state education agency (SEA) to use to strengthen turnaround efforts at the school and district levels. This publication supplies the reader with an in-depth understanding of each of the levers, and is followed by a discussion protocol to flesh out the conditions within a specific state. SEA departments, districts leaders, school staff, and thinktanks can all benefit from the discussion tool which can help individuals articulate what–and how–their state needs to do to push for bold school turnaround. Mass Insight Education identified the top ten bold actions that SEAs can take to maximize the chances that their turnaround efforts will be successful. The foundation of these levers is a strong, coherent theory of action for school turnaround/improvement. The power levers range from funding, to conditions for turnaround, to monitoring progress. This publication includes a discussion protocol for identifying the levers available in your state, and to create an action item list moving forward. The publication is now available on our website.